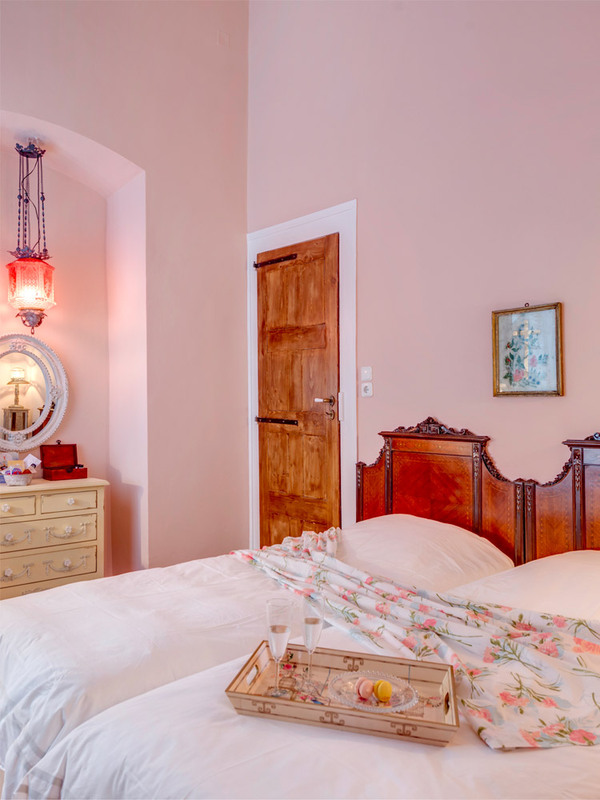 When travelling to Hermoupolis, the capital of Cyclades group of islands, there is nothing more suitable than staying at an old house at Vaporia, the most aristocratic and picturesque neighborhood on Syros. We will be glad to host you at a house that was restored with the highest respect to its history and we intend to make you feel like it is your home! 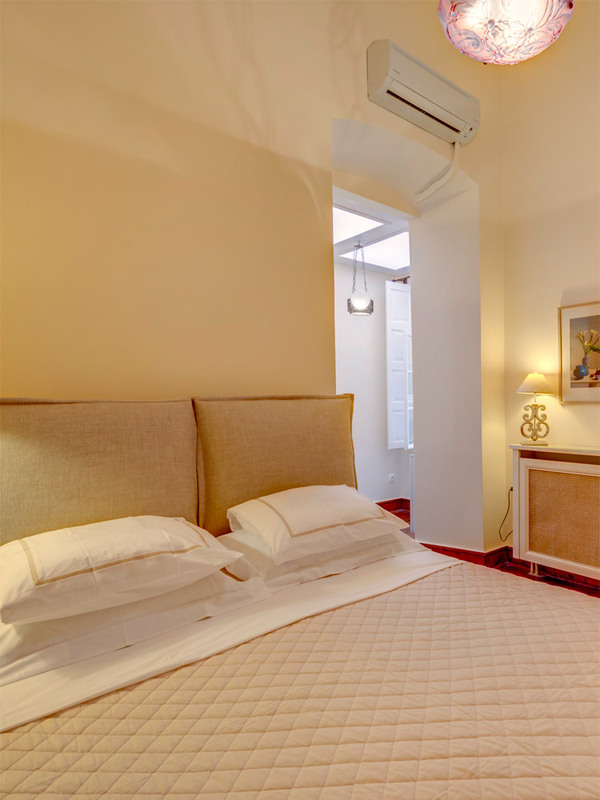 Hermoupolis Mansion warmly welcomes you! We are looking forward to take you on a tour to find out all about the mansion’s history. Let us acquaint you with the one-of-a-kind Syra and the neoclassical beauty of Hermoupolis. 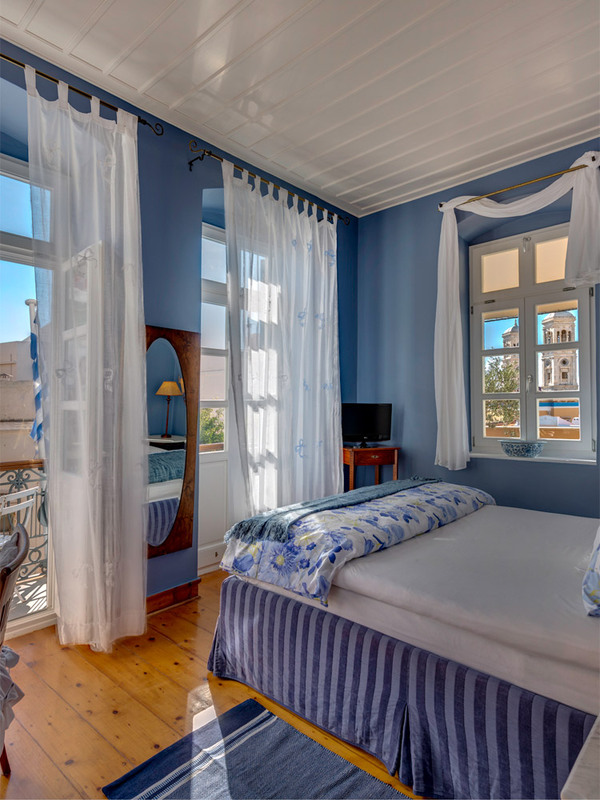 Discover the charms of Ano Syros, sing along to the classic, rebetiko song “Frangkosyriani Kyra”, and stay with us, your friends. Our goal is to exert every effort to make your time at Syros an unforgettable one! HERMOUPOLIS Mansion is a prime example of modern Neoclassicism which flourished in Hermoupolis in the 19th century. The Greek Ministry of Culture has listed our mansion as an historical monument, a characterization our building well deserves due to its rare ceiling frescoes and its exceptional architecture. Enjoy a tour of the mansion’s communal spaces and stumble upon nooks forgotten by the passage of time: the living room with its exquisite ceiling fresco; the sitting room with the three wells’ stone-built domes in the background; the small dining room next to the three wells; the larger dining room with its vintage commode and porcelain wood stove and, last, our sheltered patio with its blue ceiling fresco motif and columns. They all beckon you, ready to whisper their stories in your ear. Mrs. Rania and her husband are by far the best host you can get! Both of them are very kind and helpfull – they provided us with a lot of information about beaches, restaurants, theatre / concerts etc. and each restaurant and beach bar we visited suggested by them, was amazing! Moreover, they will also arrange the reservations for you and will do anything to make your stay unforgettable! The lovely hostess welcomes you into her beautiful house and takes very good care of you. If you have the chance to stay here, take it! She will tell you about the beautiful island, the house, help you with anything you need and make you an excellent breakfast in the morning. Definitely rent a car and go around the island. As a demanding traveler myself, I found everything I could ask for at this mansion. The room was fully equipped with top products(sheets, bath soaps). Breakfast was also really good with a variety of goodies to choose from. The general area around the hotel is very picturesque with breathtaking view just a few meters away. Finally, the true asset of the mansion is its hostess Rania who made sure I had a perfect stay. Staying at Rania’s mansion gave us the full and best experience anyone could get from the town! Everything at the mansion will give you the impression you are at the 19th century with all the amenities and luxuries of the 21st century. Proper and clean, comfortable, the room made us feel at ease. The breakfast area was very picturesque and the breakfast itself was perfect full of Greek and European delicacies! This place is for those that demand nothing but perfection for their holidays!